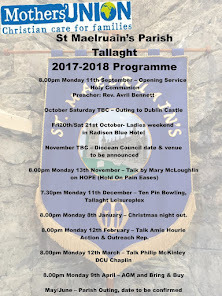 Since the start of the year we are back into the full swing of Parish Life and are looking forward to the brighter evenings. On 11th January I was invited to the home of the RC Auxiliary Bishop (for the greater Tallaght area) Eamon Walsh along with his priests from the area for “Christmas dinner”. It was a lovely evening and an opportunity to meet with the other clerics of Tallaght. I am also included in their quarterly Deanery meetings (lunch) in the Dominican Priory. Following on from our local Alpha course, which was held in An Solas Methodist Church, Jobstown at the end of last year, we held a reunion on 19th January. We have decided to meet up every seven weeks to continue the fellowship amongst those who attended the course. Congratulations and best wishes to parishioner Canon Patrick Comerford who was instituted as priest in charge of Killaloe and of Rathkeale Group of parishes on 20th January and who will also take up the role of Director for Education and Training in the Diocese Limerick in April. On Sunday 22nd January I attended, along with parishioners, a service in St. Dominic’s Church, Old Bawn, for Christina Unity Week. Our former Archbishop of Dublin Right Rev. John Neill preached on ‘Crossing Barriers’. We will be using the Bible Association for the Church of Ireland’s Lenten Course on refugees at our Wednesday morning services during Lent. In my role as Canon to Christchurch Cathedral I completed one of my twice yearly weekly slots as preacher in residence starting on… On Sunday … I preached on the Beatitudes where I tried to demonstrate that it wasn’t the blessed who are (financially) poor but those who were poor spiritually and it is the meek that shall inherit the earth as they are spiritually humble. I argued that the Beatitudes may be more practical then they initially appear, the spiritually humble are those who don’t think they can earn their way to heaven but are grateful for what Christ did for them on the cross. Perhaps what might be the new heaven and new earth that we read about in the Book of Revelations? The evensong was moved to 5pm for Candlemas, ending Christmas and Epiphany with Christ’s presentation at the Temple. After the Candlemas Service I attended the welcoming of Priest in Charge of Rev Owen Heaslip to St. Catherine’s (CORE) with whom I sit on the National Pioneer Committee (Fresh expression of Church). I was delighted for both Eoin and CORE especially as he is one of their own having led the music there before he completed his ministerial training. I was also delight e to see so many of his colleagues supporting him, old friends in a full church. I spent Wednesday evening attending the Girl’s Choir Evensong and then attending Rev Abigail Sines ‘City of Sanctuary’ meeting (welcoming refugees to Dublin). On the Thursday evening I was back in the Cathedral for Evensong on Candlemas day. Complements to all involved with the music in the Cathedral on all occasions of my visits to the Cathedral that week the music was out of this world. The funeral of Alys Alexander (wife of former Rector of St. Maelruain’s Canon Frank Alexander) took place on Thursday 16th February. We extend our sincere condolences to her sons John, Stephen and Patrick and to their extended family and friends. Canon Alexander, who was Rector here in St. Maelruain’s for thirty years and who retired in 1980 is still fondly remembered in the parish and in the wider community of Tallaght, especially for his ecumenicism. Canon Alexander was also Rector of Clondalkin and Rathcoole and was sitting ready for the expansion of the area when the inner city moved out to the ‘country’. We had a very interesting talk by Caroline Morrissey on the St John’s Ambulance and First Aid. Caroline gave us a bit of the background and history of the St John’s Ambulance and some very helpful tips on first aid and what to do in an emergency. It's good to know but hope we won't have occasion to use them! Sr. Bernadette, the Chaplain in the I.T.T. College will be coming to speak to us about her work on Monday 13th March at 8.00pm in the Small Hall. The February Whist Drive take places on Monday 20th March in the small hall, all welcome! The Girls Brigade celebrated great success at the GB District Competitions last weekend. We were delighted to win 1st place for both our Brigader team dance and our Junior/Senior team dance. We also won 3 solo medals – Rachel Cummins came 3rd place in the Brigader solo competition, Olivia Monahan came 2nd place in the Drilldown competition, and Abby Phelan came 1st place in the Drilldown competition winning a medal and the District Drilldown shield. It was a very proud day for 26thCompany St Maelruains Girls Brigade! For March Crafty Chatters is on the 7th and 21st. 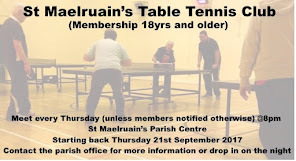 March from 2 - 4pm in St. Maelruain's Parish Hall. Looking forward to seeing everyone and if anyone would like to come and join us you will be made very welcome. 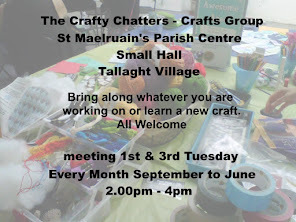 If you don’t want to do any craft work just come for the chat. 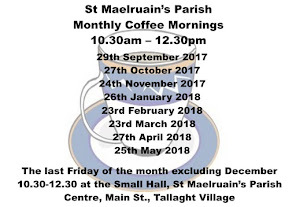 Our next Coffee Morning will be on Friday 31st March 10.30am - 12.30pm as usual in the Old Hall. All welcome to join us for a cuppa and chat. 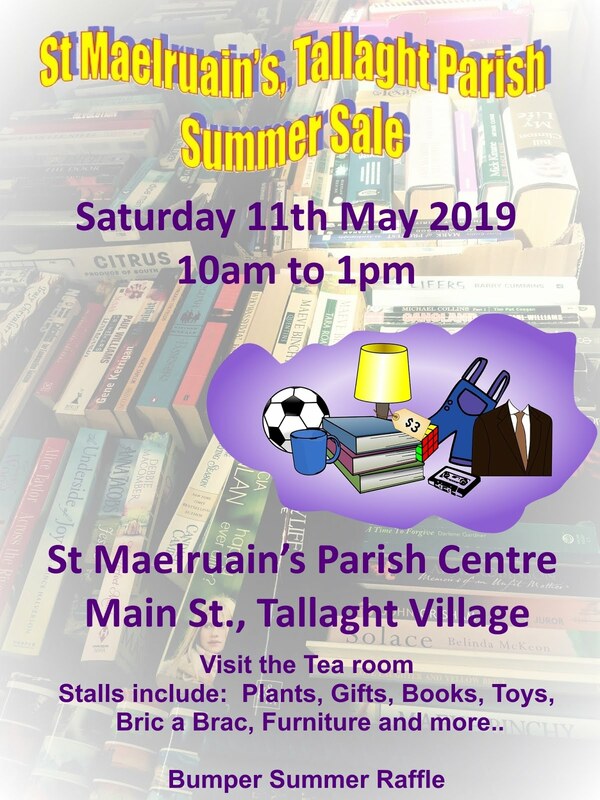 Our Summer Sale will take place on Saturday 27th May at 10.00am, all the usual stalls, tea / coffee, raffle, come on the day and bring your family and friends!